Executive committees and residents of serviced apartment buildings are desperate to collect sinking (or maintenance) funds from investors, who are stalling on the issue. The 2005 Housing Law states that a customer must pay an amount equal to 2 per cent of the purchased apartment towards maintenance funds. The fund will be managed by executive committees of the buildings which are set up, based on the agreement of dwellers in the building. On the other hand, pursuant to Decision No 08/2008/QD-BXD of May 25, 2008, by the Ministry of Construction, the building's investors are responsible for opening an account at a commercial bank for every apartment in the building when the building is ready for use. Later on, according to the decision, investors must transfer the fund to the building's executive committee, which is set up voluntarily by people in the building. However, not everyone goes by the book. For example, news website saigondautu.com.vn estimated that investors of Keangnam may be holding VND190-210 billion (US$9-10 million) in maintenance funds. However, Keangnam building's executive committee hasn't got their money back after years of knocking on the investors' doors. Other luxury apartment buildings in Ha Noi, such as The Manor, Sky City, Golden Palace and Golden Westlake seem to be facing a similar predicament. The most common responses of investors are to tell executive committees to wait or to pay back just a fraction of the fund. 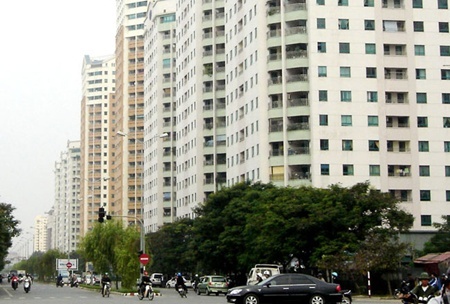 A resident of The Manor, Nguyen Nhung Hanh said, as quoted bysaigondautu.com.vn, that the building's investors were holding on to VND5.2 billion ($247,000) of the sinking fund of 58 apartments, but they had just transferred VND1 billion ($48,000) to the executive committee so far. There are, therefore, no funds available for the numerous repairs and maintenance of the building. The revised draft of the Housing Law submitted to the ongoing National Assembly proposed that district housing administrators be held responsible for the funds of its area's apartment buildings. The Ministry of Construction said that the amendment would hopefully deal with conflicts between customers and investors in managing the fund. However, experts and residents of buildings did not agree with such a change. According to Ha Noi Apartment Buildings Union, the fund is to be used by the building's dwellers for maintenance and they reserve the right to decide who will hold their money, when to do maintenance and how to do, etc. If the law gives the right to a State administrative body, it is likely to deeply interfere in civil relations and limit rights of owners. Property experts said that the Ministry of Construction should revise the regulations some other way to guarantee owners' rights.